Whenever my husband and I stay at a B&B on vacation, it’s not uncommon for my thoughts to drift into the fantasy of becoming innkeepers. A lot of this, I think, stems from my enjoyment of the quirky sitcom characters on Newhart (1982-1990) and the esprit de corps of White Christmas (1954) in which guests not only break into spontaneous song – and know all of the lyrics – but can harmonize nicely as well. Interestingly, both of these inns were set in Vermont and clearly a world away from Casa Emilia, the Peruvian B&B which features owner Michelle Tupy in this week’s Biz Buzz spotlight. Her candid comments and insights about innkeeping in the 21st century reinforce something important to keep in mind the next time you stay at a “home away from home”: if everything is cozy and totally flawless, it’s a reflection of just how hard the owners are working to make everyone feel comfortable. Note: Although Michelle and her family have since bid adieu to Casa Emilia and moved on to new adventures, her story was one of my favorites and I chose to keep it on The Biz Buzz site for anyone contemplating a future career as innkeepers. Q: Given the Canadian/Australian roots of you and your husband, Matt, how in the world did you end up managing a B&B in Peru? A: Quite by accident! We came to Cusco on a holiday and decided to stay for an extended period. About 7 months into our stay we saw, by chance, that the property was up for rent so we took it over for 12 months and turned it into a B&B – namely Casa Emilia. Q: And the story behind your establishment’s name? A: I think we tossed around a few names but they mustn’t have been very memorable as we can’t recall what they were now. Emilia is the name of our 9 year old daughter and Casa Emilia just seemed to have a nice ring to it. Our 4 year old son thinks the sign says Casa Matthew – lucky he can’t read yet. Q: What type of globetrekkers does Casa Emilia most appeal to? A: We get a variety of guests staying at Casa Emilia including single backpackers, businessmen and women, couples and families. 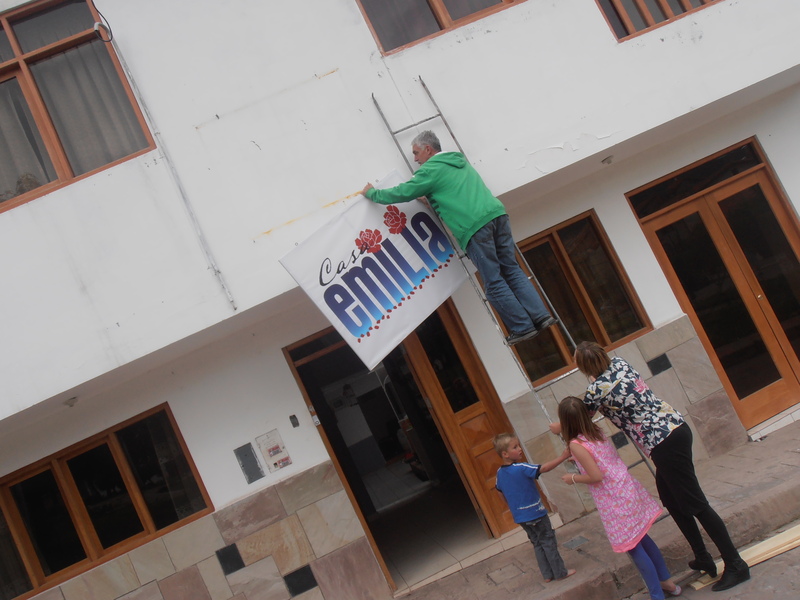 We are located in a particularly quiet area of Cusco which our guests enjoy. Sometimes being away from the hustle and bustle of it all when you are travelling, particularly in South America, is very welcome. Our guests come from all over the world – Germans, Americans, Canadians, Belgians, Dutch, Australians, Colombians, Argentinians and even Peruvians. Q: How many guests can you accommodate at one time? A: We can accommodate 23 guests at one time depending – there are 10 rooms in total although we only rent out 8 of them as we live in the other two. We have 3 family rooms, 3 double rooms and one dormitory style room available. A: We offer a complimentary continental breakfast to our short term guests consisting of bread, croissants, yoghurt, juice, cereal and tea/coffee. Our long term guests have use of the kitchen and generally self-cater. Q: What are some of the particular challenges you’ve encountered as innkeepers and how did you address them? A: We had difficulty when we first opened as the previous tenants left a lot of unpaid bills, particularly to online third party travel agents. We had to prove that we weren’t connected in any way to the previous tenants before we could set ourselves up on many of the hotel and accommodation websites. There was no overnight solution – perseverance and patience was definitely needed in abundance. Q: How would you say it’s different managing a business such as this in Peru than, for instance, Canada or Australia? A: The language barrier can be difficult at times – our Spanish is very basic. It is much different to set up a business in Peru than say Canada or Australia – definitely much more complicated. The government makes you jump through all these unnecessary hoops before you can even open your door. Q: What is a typical day like for you at Casa Emilia? A: My husband gets up at 5 a.m. and sets up the breakfast. I take our son to school at 8 a.m. and homeschool our daughter – this is usually done between 9 a.m. and midday. We clear the breakfast at 10 a.m., wash the dishes and clean the breakfast room and common areas. Our guests checkout by 11 a.m. so once they have left we clean the rooms and wash the bedding. We do the shopping for the breakfast at about midday and then pick up our son at 1 p.m. The afternoons are generally flexible depending on how many guests are here or how many we are expecting. We give our guests room keys so they are free to come and go at any time. Q: How have your kids adjusted not only to a different culture but also living at the same place where both of their parents happen to work? A: Our kids seem to be fairly flexible with our lifestyle and this can only be a good thing. Our daughter lived in China with us for a two year period when she was very young and in Canada we lived in a hotel where my husband worked for a period of two years. Our children seem to be quite resilient and adapt very well to change. Q: Are you ever able to take time off as innkeepers and go stay at someone else’s place for a change? A: No, unfortunately this has not been possible for us as we have not been able to find someone to manage the premises while we take a break. We are able to sneak off for an afternoon hike or a quick coffee here and there but for the most part, someone has to be here to manage Casa Emilia. Many of the guests that arrive on our doorstep are walk-ins so we prefer to be here as much as possible. Q: You’re also involved in promoting tourism in your neck of the woods. What’s the main attraction to Cusco for visitors who come your way? A: The main attraction here would have to be Machu Picchu although Cusco itself is a fascinating city. An interesting fact: Cusco is the oldest continuously inhabited city in the Americas. While Machu Picchu is not located in Cusco itself, it is the arrival point for those wishing to visit the ruins. To get to Machu Picchu you need to catch a bus to Ollantaytambo and then a train to Machu Picchu Pueblo – a journey which takes approximately 3 hours. It is totally worth the trip! Q: What’s your own favorite attraction? A: Machu Picchu is amazing – there is no denying that. However we like some of the lesser known places to visit. The Sacred Valley is full of quaint towns and spots to visit – Pisac is a very relaxed little town and we often go there for a coffee or some lunch for a change of scenery. Ollantaytambo offers a nice break away from it all – we went there for a few days at Christmas time prior to opening Casa Emilia. The salt fields near Moras/Moray are well worth a day trip as well. Their salted chocolate is definitely very moreish. Q: How do prospective guests find you and book a stay? A: Guests can book through a multitude of ways – however most generally prefer to book on the internet. They can book direct on our Casa Emilia website (www.casaemiliacusco.com) or on our Facebook page (https://www.facebook.com/casaemilia). We are also listed on many of the accommodation sites including AirBNB, Hostel World and Craigslist. We have been working hard to raise our profile on Trip Advisor so people know we are here – we are currently in the top 25 so we aren’t doing too badly. Q: Are these generally for overnight reservations or do you have some who stay longer? A: We get the guests who only come here to visit Machu Picchu and they generally stay a night before they go to Machu Picchu Pueblo, and then on their way back out of Cusco. Then we have many who stay for a week or a month – they are the ones looking for the more authentic Peruvian experience. The longest staying guest was for a period of six months. Q: What is something about innkeeping that most people don’t know? A: It’s probably not as glamorous as people think! We spend a lot of time cleaning and working behind the scenes to do it right. We aren’t just sitting at a desk waiting for people to walk in. Q: What do you do in your downtime…if indeed such a thing exists? A: Sleep! I must admit we enjoy our sleep. I do try to take the kids out hiking every second weekend with a local group whose aim is to get the kids outdoors and away from all things electronic, and Emilia and I go to a local writers’ group once a week. Sometimes we go to the mall or the market just to hang out or take a breather. It’s the simple things we enjoy. Q: What’s next for the Tupy family? A: We are actually planning an extensive South American trip when we finish up with Casa Emilia in February. We have decided not to renew the lease but rather take the opportunity to see some more of this vast continent. We are still in the planning stage but we are looking to visit some more attractions in Peru before heading to Chile, Argentina, Uruguay, Paraguay, Brazil, Venezuela, Colombia and Ecuador to name a few before heading up to Central America and then back home to Canada. It will definitely be the trip of a lifetime! A: We are currently seeking sponsors for our next South American venture to help fund our vehicle and some of the visa costs. More details can be found on our website – www.andoffwewent.com. We are looking forward to our adventure and in between our travels, I am looking to pen our story focusing on our adventures. Editorial Note: Michelle Tupy, an accomplished ghostwriter, is one of 30+ experts who contributed content to Office For One: The Sole Proprietor’s Survival Guide (Amazon.com) and offers invaluable advice for anyone thinking of taking their entrepreneurial skills and vision to another country.